Because as much as I love a good bubble bath + hour-long message, this working mama--who’s doing her best to balance entrepreneurship, family, life responsibilities, and taking care of herself--well, let’s just say there aren’t a lot of bubble baths happening around here. So does that mean we're doing self-care wrong? Does it mean that if luxuriating in a flower petal-filled both or indulging in day-long spa days don’t fit into the reality of your life that you’re doing it wrong? It’s simply about all the small ways you tune in, listen to your body, and take small steps to take care of yourself. It’s about flipping the script from what you should be doing, to focusing instead on what feels good. So how to make it happen in real life? 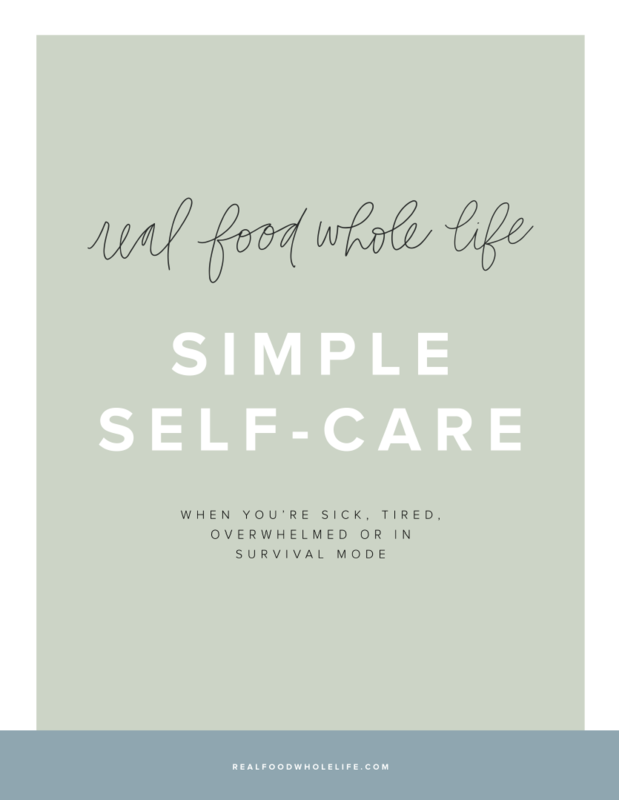 Read on for 29 real life self-care ideas that go beyond baths and massages! psssst: Remember, this is just a list of suggestions. Pick one or two to start with and go from there. If you try any of these self-care ideas, share the feel good love on Instagram and tag @realfoodwholelife so I can cheer you on! 1 | Get up 15 minutes early and . . . read something that feeds your soul. A book of poetry, science-fiction, trashy beach-read, inspirational quotes, yoga philosophy, crime novel, nonfiction, or a spiritual text -- pick a book that’s calling your name, then set your alarm for 15 minutes early for a quick reading session, just for you. 2 | Get up 15 minutes early and . . . simply sit and enjoy a hot cup of coffee or tea. The simple power of sitting and savoring can be a powerful way to practice self-care. Turn your hot drink into a self-care morning ritual by tuning into your senses: smell, sound, touch, sight. Even this small moment can make a big difference in your day. 3 | Get up 15 minutes early and . . . journal or write. Consider this 15 minutes of creative time. Free write, gratitude journal, write an email to a friend, or start chipping away at that story you’ve always wanted to write. 4 | Get up 15 minutes early and . . . stretch or walk or yoga. A little morning movement can do amazing things for your wellbeing all day long. Throw on a pair of shoes and head out the door for a neighborhood power walk, throw down a mat and do some stretching, or pop on a yoga video and find your flow. 5 | Get up 15 minutes early and . . . start working on your dream. Have a dream you’ve been harboring in the back of your mind? Consider this an invitation to start working on it, a little at a time. Register your domain, start researching shop locations, or peruse Pinterest for how-to posts. Sure, 15 minutes isn’t enough time to get everything done, but it is enough to feel like you’re moving toward something instead of doing nothing. Getting up a little earlier for self-care is fantastic, but sometimes the best self-care is listening to your body and taking the extra sleep. If you’ve been sick, have a sick little one, or you’ve been up all night, give yourself permission to sleep. That’s the best self-care of all. 7 | Create a no-phone in your room policy. The impulse to grab your phone and immediately start scrolling first thing in the morning can be hard to resist. Make things easy on yourself by charging your phone in another room. If you use your phone as an alarm clock, consider investing in a stand alone option so your room can become a phone-free zone. 8 | Turn alerts off on your phone. When you do finally grab your phone, the last thing you need in the morning is a bunch of alerts starting you in the face. Trust me, all those demands on your time, attention and energy can wait. Go into settings, and turn the alerts off. 9 | Create a morning-only app folder on your phone. Creating folders on your phone can be a great way to create boundaries for yourself when it comes to morning self-care. Consider creating a folder on your phone for apps that contribute to feeling good: meditation, podcasts, spiritual inspiration. Whatever it is, make a morning folder that you can open without getting distracted. Remember when mix tapes were a thing? When you’d spend time putting together a special playlist for someone important in your life? Yeah, let’s bring that back. Except this time, make yourself the special person. Create a playlist using Spotify or Pandora, or find one already made that makes you feel really good. Maybe it’s mellow spa music, 80’s flashback music, or rap. Playing music you love can turn an otherwise draining commute into your own personal self-care time. Podcasts are a game-changer when it comes to your daily commute. Maybe you want something inspirational, educational, entertaining, or downright hilarious. Whatever your mood or interests, chances are there’s a podcast for that. Take a few moments to download your favorites each week so you have hours of listening available without wifi required. Kids in the car who don’t want to listen along? Pop in one earbud (keep the volume low enough so you can still be aware of traffic) and listen away. I know, who makes phone calls these days anyway? Use your car time to catch up with friends and family with an old-fashioned talk in real time. Invest in a headset or earbuds so you can talk, hands-free. Like podcasts, audiobooks can completely change your daily commute from something you dread into self-care time you look forward to. Particularly if you’re someone who enjoys reading but can’t find the time, audiobooks can be just what you’re looking for. Download your book before you hit the road and you’re good to go. Whether you work in a cubicle or from home, spending some intentional time on making your environment as cozy as possible totally counts as self-care. If you’re always cold, find a cozy blanket to drape over the back of your chair. Tired feet? Hide some comfy slippers under your desk to slip into when you’re sitting. Challenge yourself to set up your space to feel as nurturing as possible. Sitting at your desk all day is the perfect opportunity to adopt a hydration habit. Find a large glass, fill it up and sip away. Straws can make drinking a lot easier. I like these and these. Also? Try implementing a caffeine cut-off, particularly if you find it difficult to fall asleep. While it can be tempting to push-through and sit in order to try to get everything done, taking short breaks is an important way to practice self-care. Set a timer on your computer or watch, to get up, and stretch. Bonus points for taking a quick walk or breathing session. Getting sucked into the gossip trap at work? Consider changing things up to protect your mental and emotional energy. Take your break in a different location, bring a book, or listen to a podcast. Changing things up can be heard at first, but you may find it makes a big difference in how you feel in the long term. The break room with its donuts, and cookies, and co-worker birthday cakes. If you find yourself giving into break room treats at 3:00 in the afternoon (even though those donuts are stale and not that good anyway) consider bringing your own stash of “worth-it” treats. Coming up with a new routine will liberate you from the break temptations and leaving you feeling really good. When it comes to lunches and breaks, be your own advocate. Chances are you are granted legal breaks throughout your day. If you’re employer isn’t making breaks available to you, speak up and advocate for yourself. And, if breaks are available and you’re not actually taking them, it’s time to change that! Consider it your mini self-care reset. Stand up (or sit down, depending on what your job requires outside of break time), get outside, take a walk, read, listen to an audiobook, or simply breathe. And, if you’re spending time in the car shuttling kids around and waiting in the car to pick up, check out Feel Good Commute Self-Care for ideas on how to reclaim some of this time for you. Evening is a great time to check in and get honest with yourself: what do you really need to feel good? Maybe a glass of wine or a zoning out on Netflix is really what you need. Or maybe turning everything off and talking with your partner or friend is what you need. Try to spend a moment turn off autopilot and instead to tune in. Creating folders on your phone can be a great way to create boundaries for yourself when it comes to evening self-care as well. Consider creating a folder on your phone for apps that contribute to feeling good and winding down: meditation, podcasts, spiritual inspiration. If endless scrolling has you feeling distracted, burned out, or burned out, consider a phone cut-off policy. Pick a time, say 8:00 or 9:00 pm, and then turn it off, plug it in, and walk away. Quitting the nighttime scrolling habit can be hard at first, but it counts as some major self-care. I know, I know, the last thing you want to do after a long day is any more work. But hear me out: taking 20 minutes to set up for the next day can make a huge difference, especially if mornings feel overwhelming and chaotic. Set the timer on your phone and spend 20 minutes getting ready for the next day: lay out your outfit, pack your lunch, prep your breakfast. Notice this 20-minutes is to get yourself ready, not necessarily anyone else. Consider the time a gift to your future self. Try making a simple list of 3 things you were grateful at the end of each day. Keep it simple and specific: a moment, a memory, a feeling. Jot down 3 things and then spend a moment to soak in the feeling. More on gratitude journaling, here.